Innoo Tech's Baby Car Mirror lets you easily keep an attentive eye on your children. This mirror offers a large and clear view at 11.8" wide and 7.4" in height. It has a shatterproof acrylic glass and is encased within a curved ABS plastic housing. There are durable and adjustable nylon straps with two adjustable clips so the mirror can be easily and quickly installed to the headrest and moved from car to car. 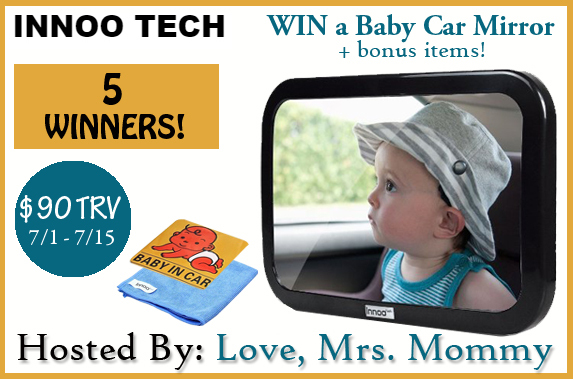 You also get a bonus "Baby in Car" sticker and cleaning cloth! If you can't wait to see if you won, you can purchase one HERE! Plus, "Baby in Car" sticker and cleaning cloth! Disclosure: Love, Mrs. Mommy is not held responsible for sponsors who do not fulfill their prize obligations. Love, Mrs. Mommy received nominal compensation to host this giveaway. This giveaway is in no way endorsed or sponsored by Facebook or any other social media site. The winner will be randomly drawn by Giveaway Tools and will be notified by email. The winner has 48 hours to reply before a new winner will be drawn. If you would like to participate in an event like this please contact LoveMrsMommy (at) gmail (dot) com. Welcome to the oh BABY Giveaway Hop, hosted by Viva Veltoro and Lindsey Blogs. I'm joining a number of other bloggers to celebrate the sweetest of deliveries… precious babies! Be sure to hop around to all the great giveaways AND don’t miss the AMAZING Grand Prize on the host blogs! Disclosure: Lindsey Blogs at SEBG, Viva Veltoro, and the OH Baby! participating bloggers are not responsible for sponsors who do not fulfill prize obligations.